Striking the perfect balance between downtown delights and rural retreats, Argentina is the ideal backdrop for an adventure that combines the sophisticated with the serene. This trip has it all: beautiful Buenos Aires, entrancing tango performances, world-class wine, and nature at its most fierce and refined. After arriving in Buenos Aires and settling in, the trip kicks off with an eye-opening private tour of the grand Argentinian capital led by an expert guide. Together, you’ll visit BA’s beloved landmarks – including historic Plaza de Mayo, the Italian-accented La Boca neighborhood, La Recoleta’s cemetery, and Palermo Woods, to name a few – and have the chance to explore the curious network of passageways recently unearthed beneath the streets of trendy San Telmo. Later, after a free day on your own to further explore the city, take in a dazzling tango show over dinner at Rojo Tango. 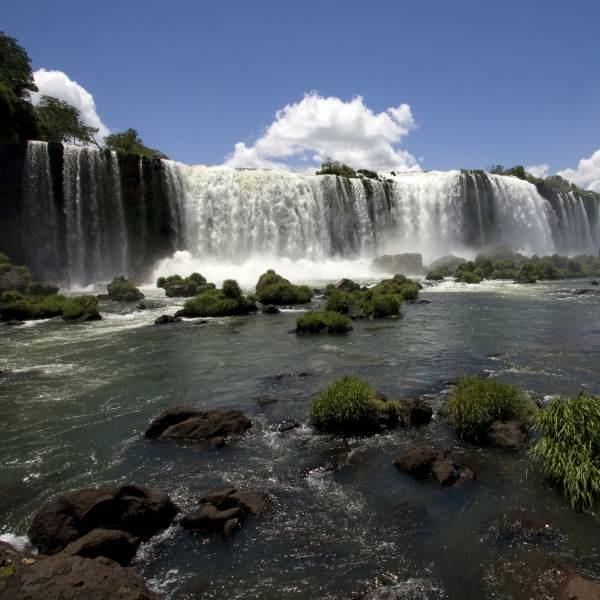 A short flight north brings you face-to-face with one of Argentina’s most stunning sights: the 275 interlined cataracts of mighty Iguazú Falls. Inside the national park that houses this breathtaking natural wonder, you’ll have the chance to walk the network of pathways to the Devil’s Throat with a private guide, then take to the river for an up-close glimpse of both the falls and the wildlife-rich rainforests that surround them. From there, head to Argentina’s western edge bound for the resort town of Bariloche where you’ll visit majestic Cathedral Mountain and discover the splendor of the scenic Andean lake district, both with the help of expert private guides. The experience concludes on a decidedly delicious note in idyllic Mendoza, Argentina’s wine country, where you’ll have the chance to explore the town, dine out at some of its world-class restaurants, and embark on a private wine-tasting tour high up in the hills south of town. (Mendoza is blessed with an abundance of micro-climates, which lend each vineyard’s grapes their own unique flavor. The best way to tell them apart: try them all!) From there, it’s back to BA and home, but not for long; once you’ve seen this side of Argentina, you’ll definitely be coming back.